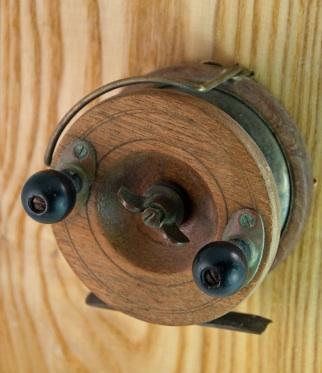 An antique fishing reel is a nosalgic collectible for many. Antique fishing reels are a popular collectible among fishermen throughout the United States. In essence, each reel has its own set of fish tales to tell. They were cared for and used by men and women who fished for pleasure, for necessity, or simply for sport. There are also those collectors who marvel at the evolution of this simple, yet effective hand-powered machine. 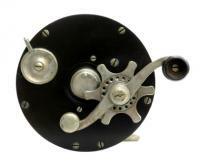 Types of antique fishing reels are as varied as the sport of fishing. However, there are a few major classifications that you should know about. Casting reels are geared for a rapid line retrieve. American versions are all cousins of the Snyder reel that was developed in the 1800s. Most have about a 60- to 100-yard capacity. Larger versions were often used for trolling or salt-water surf casting. The most famous of these reels, the "Kentucky," is distinguished with click-and-drag buttons on the headplate. These reels range in size from 150 yards to a large 20/0 Big Game Reel. When collecting, the larger the reel the more valuable it is. Most of these were produced in the United States. One of the most widely collected reels; the spinning reel has two major classifications--open face and closed face. Unusual styles are starting to bring high prices on the market. Many of them originated in Europe and were imported into the US in the 1950s. Age is not the key determining factor in value, but rather the rarity of the reel or availability of it on the marketplace. The level of quality of the original manufactured product can also play a significant role in the value. The more qualities listed above that a reel has, the more valuable it is. Hand-made reels, which took great time and care to make are very collectible because it was likely better made than a factory produced reel, and the materials used to make the reel were often much higher quality. Hand-made reels were also produced in smaller quantities, making them scarcer on the marketplace today. Also keep in mind, that no matter how old or rare a reel is, the condition of the piece is also of paramount importance. It might have all of the hallmarks of a collectible reel, but it needs to be in excellent condition to garner a high price on the market. Because 99-percent of all fishing reels do not include the date of manufacture, it is difficult to determine the age of a piece. Some reels were made over a several year period and changed very little, so the type or manufacturer won't help determine the age. One of the best ways to determine the age of your reel is to look through old catalogues from the reel maker. Antique or vintage sporting goods catalogues or magazines can also be helpful. If you want to be certain then take it to a seasoned collector who has enough years of research and documentation to properly determine the age of your reel. Many companies have manufactured reels over the last few hundred years. In addition to the big manufacturers, there are also hundreds of small hand-made reel shops that only made a limited quantity of reels. To give you a baseline of some of the bigger names to look for when collecting antique fishing reels, the list below might be helpful. If you want to learn more about antique and vintage fishing reels check out the following websites. You will find a plethora of information about this wonderful hobby.